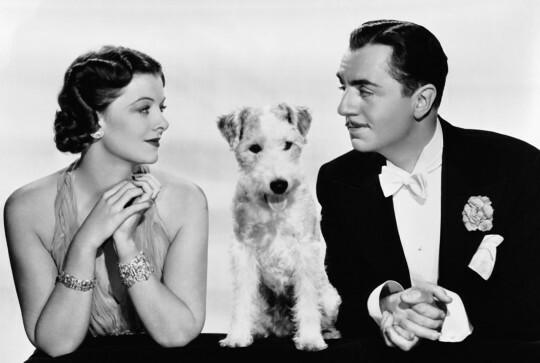 I’ve written before about my love affair with The Thin Man movies. But after viewing “William Powell: A True Gentleman” which came in the box set of “The Complete Thin Man Collection ” I am more than ever convinced that this is a man whose wit, charm and style we should seek to emulate. After a decade treading the boards in New York and not conventionally handsome, Powell started out playing villains in silent pictures. He was one of the few silent film stars to welcome the advent of the talking pictures, confident that his stage training would see him through. He was right. Women, in particular, found him dashing and liked his brand of scoundrel. He started playing leads, and attracted attention as the elegant private detective in Philo Vance in “The Canary Murder Case” (1929). But it was in 1934 when he went to MGM to star opposite Myrna Loy in “Manhattan Melodrama” that something clicked. According to the director, they two had an off set banter that kept all around them in the best spirits. They were both cast in “the Thin Man” as a result with Myrna Loy commenting later that it was the most fun she ever had in the movies. Although married and divorced three times, the worst thing ever said about him by an ex-wife is that he was “rather fastidious.” By the end of his career in 1955, he had received three Academy Award nominations. Not bad for a guy who started out playing the heavy. If you haven’t seen them already, buy “The Thin Man” series outright. Venturing deeper into his work, I highly recommend “Life with Father” and “Mister Roberts” which showcase William Powell’s remarkable range. This entry was posted in Elegantology and tagged "Life with Father", "Manhattan Melodrama", "Mister Roberts", "The Canary Murder Case", Lauren Bacall, Myrna Loy, Philo Vance, The Thin Man, William Powell, William Powell: A True Gentleman". Bookmark the permalink. Adore them both and I have my step mother to thank; she made me watch when I was in high school. Just watched “My Man Godfrey” last week and was thoroughly entertained. Looking forward to his other films. If your cable or satellite system gets Turner Classic Movies, they’re showing “The Thin Man” tomorrow 11/28 at noon Eastern. Love these old movies- tonight is windy and watching one of these would just do the trick! Love the Thin Man series and William Powell. entitled “Before the Thin Man” . the magic Thin Man formula. Of course love Thin Man series and Philo Vance as well, but “Life with Father” is on my top five all time favorite movies list. I quote from it daily, as does my husband. Daughter is taking a nap. Sat down to watch ‘The Thin Man’ on TCM and decided to check the feeds. What pops up first? This post. Thank goodness for local TV stations in the 80’s. I love this series and it sparked my life-long fascination with both Myrna Loy and Powell. Loy because…well she’s Myrna Loy. Powell because he was the smoothest man this side of Cary Grant. The only downside to this series was my ill-fated attempt at a Powell mustache in the 90’s. Indeed! As they say, “they don’t make them like that anymore”. My belated wishes for Happy Thanksgiving! Mr. Wingfield, I’ll look for it. Johnny, I regret to say that my pencil-thin moustache was a more recent attempt. I had a wire fox terrier for years and lost him in the divorce. God, how I loved that dog. Thin Man’s are worth repeated viewings for the details. My favorite was the discovery of Powell’s pocket square in his bathrobe as well as his foot long (one assumes Dunhill) pocket flask. I’ve been seriously thinking of another Asta. Whenever I see these dogs I can’t keep a smile from breaking out. We all adore Asta at our house.